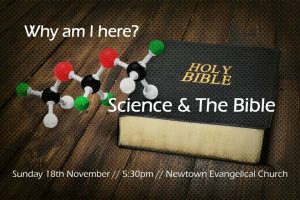 We’re grateful that Dr Andy Christofides will be joining us this Sunday to look at that question. The evening will be relaxed, with baked potatoes being served at 5:30 and chance to discuss the topic, before Andy speaks. If you’re someone asking these questions, or would like to be better equipped to answer such questions yourself, we’re sure you’ll find this a really useful time.